Child labour, Gender Equality and Rural/ Urban Disparities. How can Ethiopia’s national development stategies best address negative pill-over impacts on child education and well-being? This paper analyses the extent to which the policy prescriptions and implementations of the Ethiopian Development and Power Reduction Program(SDPRP). (2002-2005) are impacting poor children’s time usage- namely how thier time is divided between eductaion, work activities and play. In 1997 the government of Uganda introduced the policy of Universal Primary Education – UPE whose aim was to improve on school enrolment. Equal opportunity and access to education is a central theme in the political agenda of government of Uganda, indeed universal access to primary education is MDG Goal II, which governments world over are striving to achieve. Research has not established whether inequalities in access to education still exist a decade after UPE was introduced in the country. Using data from the Uganda National Household Survey 2009/2010, this paper attempts to examine this issue. A total of 12,424 children of ages 6-17 years are selected for study. A measure of unevenness – Theil’s index and a multinomial logistic regression are fitted to the data, adjusted for a number of social and demographic characteristics. The findings suggest that 81% of the children were currently attending school. Gender inequalities in school enrolment were not supported by the regression model findings. However, substantial and significant differences were observed for the various regions of the country, rural-urban residence, poverty status age of child, and household size. Although not all factors affecting current enrolment among children were analyzed, the discourse in this paper suggests need for intervention to address specific child enrolment inequalities identified. It is widely agreed that studying the relationship between school quality and academic achievement will benefit public investment in education. This is particularly true in Africa where, the 1990 World Conference on ‘Education for All’ led to renewed commitments to quality basic education. At this time, Uganda implemented a set of public reforms that were designed to increase educational opportunities in poor communities. 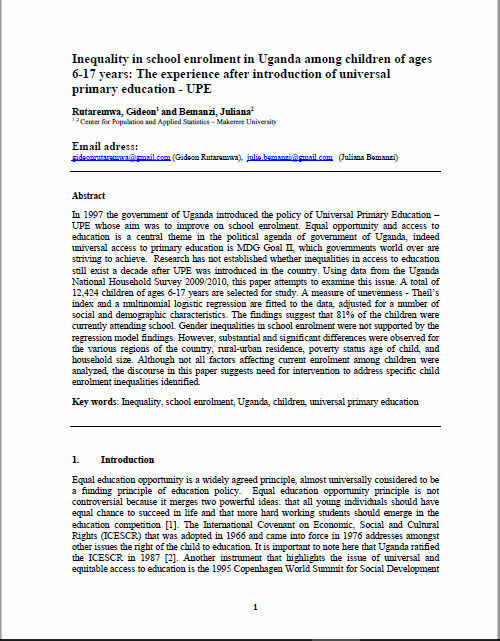 This paper uses data from the second wave of a cross-national survey of schools in Southern and Eastern Africa to assess some dimensions of these Ugandan reforms. Hierarchical linear models are estimated to investigate which schools most effectively ensure a meaningful educational experience for children who face economic and social hardships. Contrary to earlier studies in developing countries, the positive relationship between socioeconomic status and student performance is striking and significant. In line with the school effectiveness theory, resource availability proves to be consistently related to educational quality and its equitable distribution in Uganda. This study investigated the barriers that educators faced in involving fathers in the academic development of their children in the foundation phase education in South Africa. The study adopted the qualitative case study approach and followed the interpretivist paradigm to investigate the participants in their natural setting. The sample size comprised six educators who were purposively selected to respond to semi-structured interview questions. All ethical procedures were observed and respondents completed the consent forms. Data collected was thematically analyzed. The findings revealed that lack of knowledge, absent father syndrome, migrant labor, educational poverty and political will were the main barriers to father involvement. The study concluded that effective fathers’ participation in the education of their children is necessary to achieving the goals of early childhood education. The study recommends that programs should be tailor-made to suite all categories of fathers in order to encourage father participation regardless of their economic status. As the world becomes more urban and slums continue to grow in developing countries, research is needed to measure utilization of health services, health outcomes, and access to health care providers among urban slum residents. Estimating trends in urban health among slum residents relative to other urban inhabitants provides evidence of health disparities for priority-setting by program implementers and policy- makers. Research on the negative effects of slum environments on human health has started to emerge, yet there remains a paucity of evidence on morbidity trends over time and inequalities between slum residents and other urban residents. The goal of this study is to quantify maternal and child health care access, utilization and outcomes among urban slum dwellers in selected countries in sub-Saharan Africa and South Asia over time. These three areas are addressed in three separate dissertation manuscripts. Child labor remains a concern for policy makers considering its interrelations with human capital formation. Indeed, in Sub-Saharan Africa and particularly in Cote d’Ivoire, children are still on the labor market. Several factors explain this fact of setting children to work. Given this diversity of determinants of child labor, this study aims to show the effects of school resources on child labor. Therefore, we use the 2010 national survey data on child labor and education policies. From a bivariate probit model, the results showed that the availability of certain school resources as a canteen and a drinking water point in the school promotes the education of children and especially girls. On the contrary, their unavailability forces parents to put their children on labor market. Therefore, one of the major policies to be implemented is to improve the learning environment of children by building school canteens and drinking water point in schools. It’s a new challenge for policy makers to effectively ght against child labor and reach the goal of education for all and of quality in 2030. Social epidemiology models suggest that socioeconomic status (SES) mobility across the life course affects blood pressure. The aim of this study was to investigate the association between SES change between infancy and adolescence, and blood pressure, in young adults, and the impact of early growth on this relationship.